Wild Asia’s RSPO-LAC+ is offering a new approach to the lead auditors training course which will enhance the learner’s auditing skills and knowledge in order to prepare auditors for the dynamic nature of the RSPO standard. Endorsed by the RSPO, the course is designed for auditors and members of the palm oil supply chain to gain a better understanding of RSPO P&C audting process. Our LAC+ consist of online modules, classroom lectures, group works and practical audit exercise. This 15th course will combine the experience and expertise of Wild Asia trainers in both the system and practical implementation of the RSPO standard. View more details under each info tab below. The outcome of this course will see participants having a better and clearer understanding of how to audit palm plantations and mill within the context of RSPO certification system. Participants will also gain a greater understanding of the management system that governs the standards and any latest updates relating to the RSPO. This course, or its equivalent, is mandatory for all RSPO auditors. Part Two – Practical. A physical classroom sessions which will focus on case studies, practical exercises and a final evaluation. The course will be highlighting the audit situations through short lectures, group and individual exercises of case studies, a one-day practical audit exercise and a final written examination. All participants must pass the online modules evaluations prior to attending the classroom component to demonstrate that they have the understanding and basic knowledge of the RSPO Principles & Criteria (P&C) and the related system documentation. *For the existing lead Auditors who wish to take P&C Referesher Course, you will only require to take Part One – Online and 2.5 days of the Part Two – Practical. Not required to attend the final written examination. Seats are limited! Please email your registration form to training [at] wildasia.org to secure your place. Only participants that have paid will be allowed to reserve a seat for the course. Hi Victor, please send in your registration. Thanks. please email me details of the course including fees chargeable. Hi, I’m working with oil palm plantation company in Sabah. Job scope as Sustainability Officer.. I’m new to this job..Am i entitle to join this course? I want take this RSPO lead auditor course on 22 – 26 january 2018. Can i still get early bird price because i financing this course by my own. Thank you. 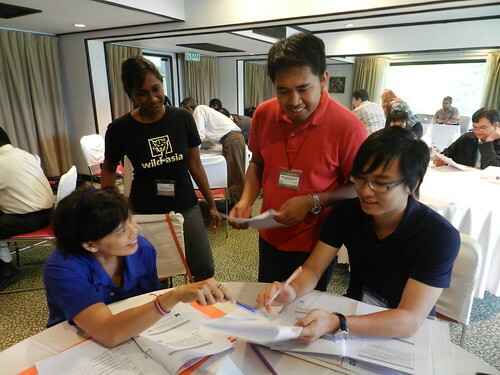 Pls email rspo lead training course next schedule. Thank you. I am a FSC Forest Lead Auditor and a Rainforest Alliance SAN Agricultural Lead Auditor based in Cameroon (Central Africa). I wish to follow the RSPO Lead Auditor training to complete my capacities in sustainable management certification.